Holacracy is an entire “operating system” for an intelligent organization. As with most systems, there are a lot of pieces and parts, but my favorite by far is the Tactical Meeting. Ironically as I write this on Medium, I recall sitting in the office of the guy who implemented Holacracy at Medium. He admitted that as a company they had thrown out certain parts of Holacracy and the biggest thing they still used and loved was the tactical meeting. Here’s a link to Holacracy’s official document on the tactical meeting and below I’ll share in my own words, what it will take to run them and how to implement this using free tools instead of Holacracy’s Glass Frog software. 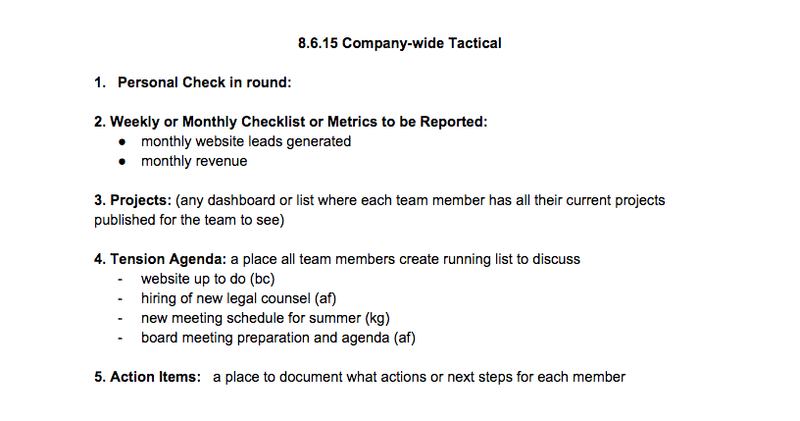 Tactical meetings can take place for an entire company (if it’s small) or a sub-set or department of the company such as marketing or finance/legal/HR. All you need for the meeting is a room, laptop with a Google Doc for the meeting agenda and two team members who play key roles. In Holacracy everyone has multiple roles they fill. They can be as specific as “monthly email newsletter sender” or as broad as “happiness advocate.” In a Tactical Meeting there are two main roles that are needed to make the meeting run smoothly. Facilitator — The facilitator is in charge of keeping the meeting on task, welcoming the team and setting the pace for the different stages of the meeting and the discussions that takes place in each stage. 2. Secretary (or note master) — is in charge of scheduling the meeting time with the team, documenting the “tension list” for the meeting and creating action items or projects for team members based off the tension processing. That’s okay. I promise it’s not very complicated and you can follow the outline below to run your own meeting. However you may want to hire a facilitator to get your team into the flow for the first month. You can even hire me to help facilitate if you’d like. Check in round — around in a circle each participant takes up to a minute to “check in” with themselves personally and with others how they are feeling. Checking in helps us understand the current emotional state your fellow teammates are in and allows for more empathy and understanding of the human context each person that walks into the meeting. I’m feeling distracted today because of X, I was stuck in traffic for an hour this morning so I’m Y, this morning was great cause I just closed a deal..
Metrics/Checklist - a weekly or monthly round where team members can provide a short update on a given metric or occurrence. I think these can be optional, but they can crucial to some metric driven teams. Project Updates — each person goes through their list of projects and can provide an update to the team if they see fit. If a project hasn’t moved forward they can say “no update” and this should not be frowned upon. There is always more work assigned than can be physically completed, but if team members feel tension about a project update or lack there of, they can raise this in the meeting agenda. Tension Gathering — This is when the meeting agenda gets organically created by everyone telling the secretary or note master what their tension is, or by writing it themselves on the Google Doc in a chronological list. After a few minutes of everyone sharing tensions such as: “August’s revenue” “new marketing hire” “staffing for upcoming events” “bathroom cleanup” there is a long list of items and each tension is owned by the person who has vocalized it, meaning they get to decide when the tension is resolved with the right project or action item. Tension Processing — now here’s where things get fun. Since the meeting has a “hard stop” time, most meetings are one hour, the facilitator role must dedicate a roughly equal amount of time for each tension to process. through each tension within that time period. For example if there’s 20 tensions and 40 minutes left in the meeting, they should hurry along the discussion so that each tension is resolved in about two minutes. This is the real beauty of the meeting. There is someone in charge to make sure everyone’s tension is heard and that each tension is getting an action item or next step assigned to someone which would resolve their tension. This makes meetings more democratic instead of being run by the person who is the most politically savvy or verbally astute. To re-iterate, at the start of the meeting everyone writes and speaks their “tension” into a scratch pad for the meeting agenda. For example the following tensions would usually be written with a few words in a vertical list so they can be checked off one by one. The tension owner can engage others in the group as needed. Some typical ways to start their tension processing is to allow for an open discussion for everyone, a short chain reaction round where each person in the circle says something or they can ask a specific person a question. But the key here is that the person with the tension owns the discussion and it cannot be derailed by someone else who has another tension about another topic. At the end of the meeting there is a list of projects or actions assigned to individuals and hopefully a room full of people who have gotten a few things off their chest. The process is designed to uncover the entire company’s issues and give all issues equal space for the team to process and take action upon. Closing round — after the facilitator calls an end to the meeting it’s time for a closing round where you go around in a circle and each team member can say anything they are feeling to end the meeting. Once again, each person has a voice, however the facilitator keeps everyone on task stopping back and fourth discussion, which can always be continued outside of the defined tactical meeting space. Not sold on the Tactical Meeting format yet? 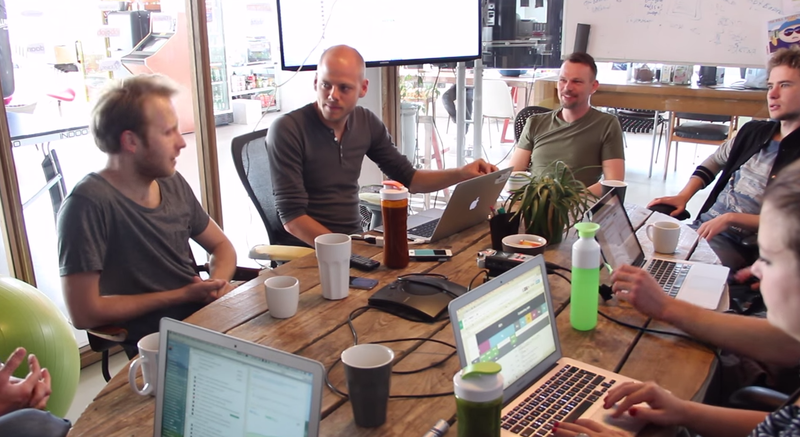 Here’s a video of a company running their own 16 minute tactical meeting. What’s your experience with tactical meetings? Would love to hear any tweaks you make to your meetings or feel free to ping me if you have any questions or would like some help in facilitating a tactical meeting for your team.